If you are planning to build a custom retirement or vacation home in the Ketchum/Sun Valley area, One World Builders is the answer. We are one of the premiere custom home builders in Idaho. 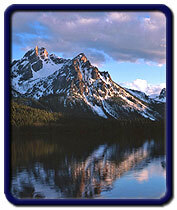 For more information visit "About Us" and the "Gallery" section or contact us 208.280.3333. To further familiarize yourself with this beautiful area, listed below is some information that may be helpful. The elevation of the Ketchum/Sun Valley area is approximately 5900 feet and is located in a valley surrounded by the Sawtooth and Challis National Forest. It is approximately 130 miles from the Boise, state capital of Idaho and 80 miles north of Twin Falls. Other major communities in the area include the towns of Bellevue and Hailey. Sun Valley and Ketchum are located less than one mile from each other. Due to the ideal ski conditions, Sun Valley became a popular ski resort in the 1930's and grew to become a world renown vacation spot for winter skiing. 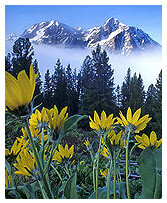 The many outdoor activities year round make Ketchum/Sun Valley an ideal area for a retirement or vacation home. The population of Sun Valley is 1,406 (2010 US Census) and Ketchum is 2,689 (2010 US Census). Blaine County has a population of 21,376 (2010 US Census) and the towns of Hailey and Bellevue have a population of 7,960 and 2,287 respectively (2010 US Census). The town of Ketchum kept its' historical charm as it once was. The old buildings and traditional festivals including the Wagon Days Celebration bring back the historical charm as a pioneering and mining town. Ernest Hemingway, who lived and died in Ketchum, truly reflects the ruggedness and beauty of this area. The first ski resort to open in North America in 1936 and home of the very first chair lift is Sun Valley. It is currently one of the top ski and summer resort towns in the country and attracts visitors worldwide. Its' many outdoor activities and many days of sunshine attract many popular individuals. Bill Gates, Tom Hanks, Bruce Willis, Demi Moore, Oprah Winfrey, Sen. John Kerry, Clint Eastwood, Mariel Hemingway and Arnold Schwarzenegger, are just some of many famous people that own a home in this area. One World Builders is a premiere custom home builder in Idaho with emphasis in the Ketchum/Sun Valley, Twin Falls and Boise area. 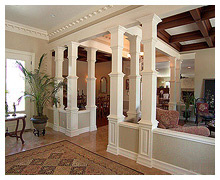 We specialize in building quality custom homes that fit the needs and artistic tastes of our clients. Contact us at 208.280.3333 for an initial consultation or for further questions.